We are sorry to report that one of our Craiger’s List dogs has passed on to the Rainbow Bridge. Haley was adopted by Chris and Amy Weaver who live in Waynesboro, PA.
Haley died during surgery to remove a very large tumor on her lung. Haley is one of six greyhounds that Amy and Chris have adopted; all of their greyhounds are like their children and are dearly loved. Haley was on a farm in Kansas when we saw her photo. The owner was retiring and all of the dogs at his farm were being left with no place to go. Haley was a brood mom and a senior. We brought Haley here to Maryland and placed her on Craiger’s List. Chris and Amy saw her and asked to adopt her. Haley was eleven years old January 18. We know that, although she was a senior, Chris and Amy are very upset about losing one of their beloved hounds. They love greyhounds and have adopted two seniors in addition to the four younger dogs they adopted. The second dog they adopted from our group was also a Craiger’s List dog. 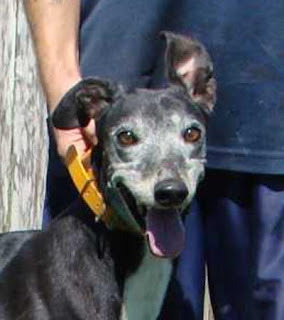 Hope was a very shy and fearful greyhound. But thanks to Chris and Amy’s good care and patience, she has done wonderfully. Chris and Amy have adopted two dogs from our group and have been wonderful volunteers. They have initiated meet and greets all over for us and have done many events as well. While we are sad that Chris and Amy have lost their beloved Haley, we know that she had a wonderful life and was greatly loved. Rest in peace sweet Haley.